WhitewaterWeary? - With pro paddler Anna Levesque's tips, you'll be running falls in no time . How'd you I like to sit in a small boat (white wearing a skirt) and bomb down the rapids of your, local creek, or the world's gnarliest rivers? According to a recent study by the Outdoor Industry Association more than 2 million people participate in whitewater kayaking every year. And white young men are the primary demographic attracted to kayaking lots of organisations are out to recruit women to get hooked on the sport. One of those organizations is Girls at Play created by pro kayaker Anna Levesque Originally from Canada but now residing in Asheville , North Carolina , Anna won a bronze medal at the 2001 World Freestyle Championships and is a five time Canadian Freestyle Team member. She racked up female first descents in California and on the White Nile River in Uganda . With a history of working in more than 10 countries as a professional kayaker and an international guide. Anna is a great source of information about kayaking whether you're new to the sport or jonesing to compete. 3) Get fitted. When choosing a boat, it's important to understand the different designs and how they're meant to perform. Just because a boat is small doesn't automatically mean that it's a good boat for women. "If the paddler is a beginner or prefers stability. putting her in a small play boat can be counterproductive for her skill advancement and for confidence building.' explains Anna. She recommends a small river-runner boat like the Dagger Mamba 7.5. or the Dagger 7.8 for a beginner. 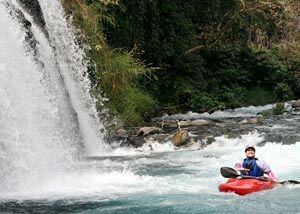 Because most whitewater kayak designs, come in at least two sizes, you should be able go find a boat that truly fits. 4) Train physically and Mentally, Core strength and rotation are key in kayaking, so be sure to cross-train with yoga. Pilates andcore strengthening exercises. 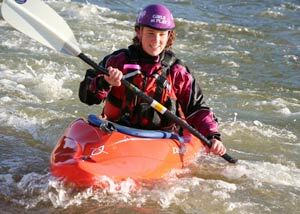 'Kayaking takes more psychological strength than physical strength,' says Anna. 'so it's important to build your confidence.' She warns against falling into the habit of always following your friends down the river, suggesting that beginners learn to 'read' whitewater-looking at the rapid and recognising the safe path as well as the obstacles to avoid. According to Anna, even beginners can learn how to pick their own lines in class I and II whitewater and make their own decisions about what they will and won't run "A great way to learn how to read water is to look at whitewater with an instructor pointing out what you should he looking for." she says 'or by watching an instructional DVD such as my Whitewater Kayaking Basics for Women 1. "